Located in the very heart of Paris, just 400 metres from the Louvre, Hotel Montpensier offers a 24-hour front desk and free Wi-Fi access in all areas. All rooms are serviced by a lift. Each room includes a flat-screen TV and a private bathroom with a bath or shower and a hairdryer. A buffet breakfast is available daily, and can be served in the comfort of your room. You will find a wide range of restaurants, cafés and shops within a 5-minute walk from the hotel. Palais Royal ? Musée du Louvre Metro Station is 200 metres away. 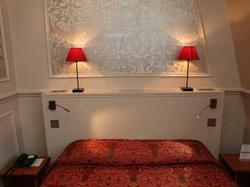 This quadruple room offers 2 single beds and 1 double bed.